Fast forward 150-years to a property in this area within two traditional Hawaiian ahupuaʻa (land divisions.) The eastern half of the property is located within the ahupuaʻa of Kealahewa (wrong way) and the western half is located within the ahupuaʻa of Opihipau (opihi (limpets) all gone.) The property was used by the Hawi Mill and Plantation Company in its sugar operations. Later, on June 25, 1927, an Executive Order set aside nearly 38-acres of the property for an airplane landing field for the US Air Service to be under the management and control of the War Department. The airfield is about three miles northwest of the town of Hawi on the northern tip of the coast of the Big Island of Hawaiʻi. In 1933, the Army named it Suiter Field, in honor of 1st Lieutenant Wilbur C Suiter who was killed in action serving in 135th Aero Squadron. Suiter was posthumously issued the Distinguished Service Cross and Silver Star Citation for extraordinary heroism in action. He and his observer (Guy E Morse) fearlessly volunteered for the perilous mission of locating the enemy’s advance unit in the rear of the Hindenburg line. Disregarding the hail of machine gun fire and bursting anti-aircraft shell, they invaded the enemy territory at a low altitude and accomplished his mission, securing information of the greatest importance. In the early days of aviation in Hawaiʻi, the US Signal Corps maintained a communication station at Suiter Field. Inter-Island Airways (later known as Hawaiian Air,) which began passenger service in 1929, used the field as an emergency stop on its route to Hilo, as well as to provide air service to the district of Kohala. On June 26, 1929, Governor’s Executive Order No. 363 added 57-acres to Upolu Airplane Landing Field to be under the control and management of the War Department. Shortly thereafter, December 16, 1929, the Territorial Aeronautics Commission sought to have the property returned to the Territory for the Upolu aeroplane landing field. In January 1930, the War Department granted the Territory concurrent use of the Army landing field for official and commercial aviation use. Within 7-months later, about 97-percent of the land was restored to the Territory. A couple of months later, about 95 acres were dedicated to establish the Upolu Airport under control of the Territory. Upolu field was grass on a sandy soil and partially graded. The Army maintained a barracks and radio station at the field on Federal property. The Upolu Point Airport consisted of one large runway in the shape of an hour glass 3,500 feet long. Before the bombing of Pearl Harbor on December 7, 1941, a contract had been let and work was ready to start on the new airport – the war stopped that. During World War II, the Navy occupied Upolu Airport establishing a weather and communication station there. The facility was used as an auxiliary field to the Naval Air Station, Hilo, for field-carrier-landing practice and other training of carrier pilots. The Upolu Point Military Reservation included facilities for naval purposes and for the operation and maintenance of military airplanes and airships. These facilities included a 150-foot-wide by 4,000-foot long surfaced runway, an aircraft parking area, a catapult deck, administration buildings, personnel quarters and a bunch of support buildings. A simulated deck of an aircraft carrier was installed and air-group pilots completed their training by qualifying in day and night deck landings before going aboard the carriers for combat duty. From July 1944 to May 1947 the facility was used exclusively for naval and other military purposes. Upolu Airport was returned to the Territory after the war, and air service was provided by scheduled and non-scheduled operators. Buildings formerly occupied by the Navy were rehabilitated for use as a terminal and for other purposes. It was used for a time by Inter-Island Airways, Ltd. for small Sikorsky amphibians, but could not be used for large aircraft. A 1946 Master Plan for Upolu included a 4,000 foot by 150 foot runway. By 1948, the paved runway was 4,000 feet in length and Upolu was the only airport in that part of the island which met the requirements for scheduled airline operation. Hawaiian Airlines was the principal user of the airport and made one stop a day en route from Honolulu to Hilo, and one stop en route from Hilo to Honolulu. A new Master Plan was completed in March 1999. The airfield included a single runway (7-25), taxiway and an aircraft parking apron. Runway 7-25 was 3,800 feet long and 75 feet wide and aligned in an east-northeast to west-southwest direction. 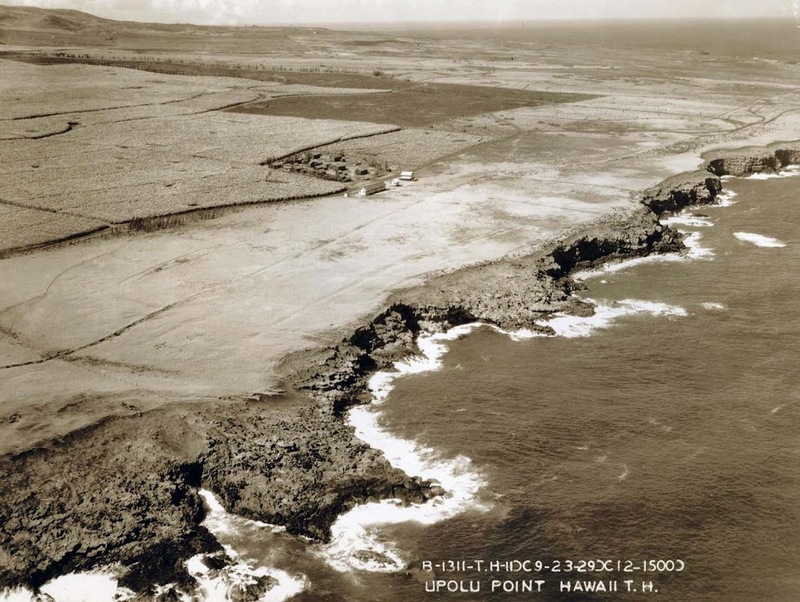 The image shows Suiter Field at Upolu Point in 1929 (Hawaii-gov.). In addition, I have added related images in a folder of like name in the Photos section on my Facebook and Google+ pages.